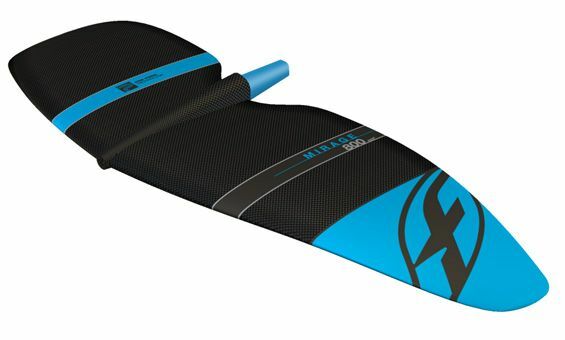 The F-ONE MIRAGE kitefoil wings range is made of 3 sizes to suit all freeride and freestyle needs. Extremely easy to control, these wings offer smooth take-offs, effortless turns and fantastic stability. Flatter in the middle with tips accurately arched down the three wings share a similar arch profile which provides plenty of control and total maneuverability. Their aspect ratio is compact, providing more freedom in all maneuvers. They also have a refined twist distribution which not only helps with the glide but also make the power of the wing more manageable when carving lines. To maintain optimal control, we build these wings in carbon pre-preg. And the larger sizes also have a foam core to keep them light. All sizes share the same metal insert with the FCD connector fully machined via CNC for a strong and perfect assembly. The MIRAGE wings fit all 2018 F-ONE foils, and also previous versions. All perfectly balanced, the MIRAGE wings are very accessible to any skill level with the larger sizes and will impress the most advanced riders with the smaller sizes. They are perfect for anyone who likes to cruise and carve some lines on their foil. 650 cm2 - the smallest size also has the thinnest profile to provide a really nice glide together with some endless carving possibilities. The best speed to carving combo. 800 cm2 - the most versatile size of the range offers good lift, good glide and super smooth manoeuvrability. Kapcsolódó linkek "Mirage 650 Kitefoil"
Vásárlói értékelés "Mirage 650 Kitefoil"